Kids love to paint! Sometimes it can be fun to step outside of the norm and let them paint with something other than a paintbrush. 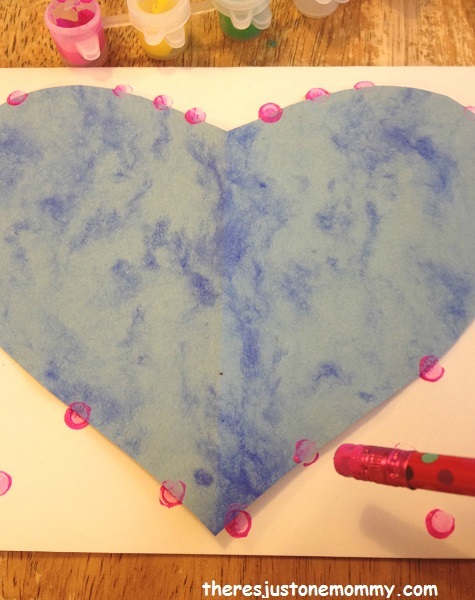 This week for one of our Valentine’s Day crafts for kids, we made some cute eraser-stamp painting homemade Valentines. We love making homemade Valentine’s Day cards each year. If you have a boy, you may want to check out our rocket Valentines. They really fly! Eraser-stamping is easy enough for even little ones to give it a try! To create your eraser stamped Valentines, fold your paper in half to make a card shape. Cut out hearts from some scrap paper. Make sure the heart is small enough to fit on your card. Place the heart on the front of the card. To keep the heart in place during stamping, secure it to your card with a small piece of painter’s tape. Then it’s time for stamping! This craft works better if you get just a little paint on the end of the pencil eraser — too much paint will make it look gloppy! I found that with both of my kids it worked better to put a little of each paint color on a paper plate for them to dip in to. Older kids may be able to just dab their pencil eraser directly into the paint pot. To get the heart-shape to appear on your card, you will need to stamp along the heart’s edge. We chose to stamp the entire card with the pencil eraser, using a variety of colors. Once the paint is completely dry, carefully peel the heart from the card and you will have a beautiful heart image! 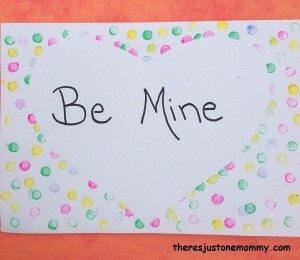 Write “Be Mine,” “Happy Valentine’s Day,” or the message of your choice in the open heart space. These eraser stamped painting homemade Valentines would be cute to pass out to friends at school! 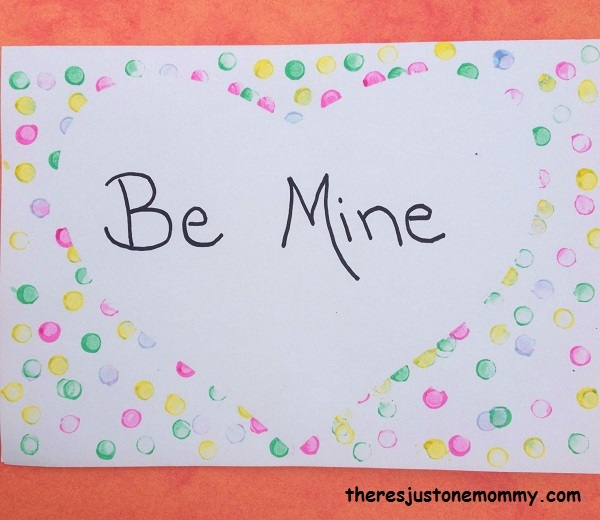 37 Homemade Valentines Kids Can Make from Crystal & Co. This is so beautiful! What a creative way to stamp! Sending cards is an art that has long been lost it seems! 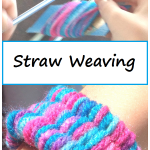 Love the simplicity of this craft and it turns out so pretty! Love it! 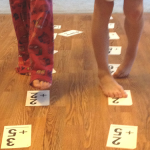 We did eraser stamping Christmas cards and this was so my fun for my children. 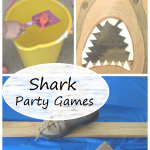 I love seeing activities that I use to enjoy as a child being done with children. 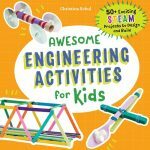 Cute and easy for little ones! We always make homemade Valentines for family and friends. I can’t believe it’s almost time to get busy with those! Yikes the year is already flying. I know! It’s like I blinked and we were half way through January. Where did November and December go? ?